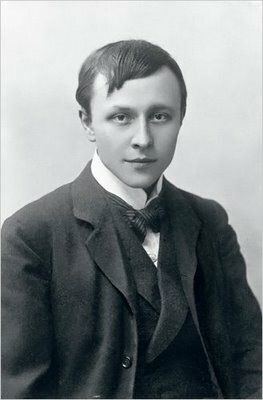 Alfred Kubin (1877 – 1959) is usually categorised as an Expressionist, but I’m going to put my foot down, despite having no qualifications as an art historian, and call him a Symbolist. I concur that Kubin is a Symbolist first and foremost. I rate him quite highly but he is something of an acquired taste. I wish I had picked up a copy of The Other Side when it first came out as these days it retails on Amazon, even second hand, between £50 and £180. Yikes! Agh, I didn’t realise it had gone up that much! Curses. I really like Kubin – he was obviously influenced by Redon, but I actually prefer him. I suppose I sort of like art that is initially repulsive. Kubin was amazing. I think that art historians who like clear cut pigeon-holes and crisp defining borders, possibly find Kubin difficult to categorise. If labels are to be applied though, then there are valid reasons for associating Kubin with both Symbolism / Decadence and with Expressionism. Actually, I feel that although there are differences, the connections between Expressionism and Symbolism / Decadence are stronger than many history of art books would suggest. Yes, I don’t like to put artists in strict categories either. Symbolism has so many ties with other movements like Expressionism and Surrealism. It just annoyed me that every source I looked at only spoe about Kubin as an Expressionist! The Other Side (illustrated and in English) is an expensive book to acquire, I’m surprised that Dedalus or Dover editions or a similar publishing house haven’t issued a reprint. Ooh, thanks for the link! I’ve been looking wistfully at The Other Side for some time now. 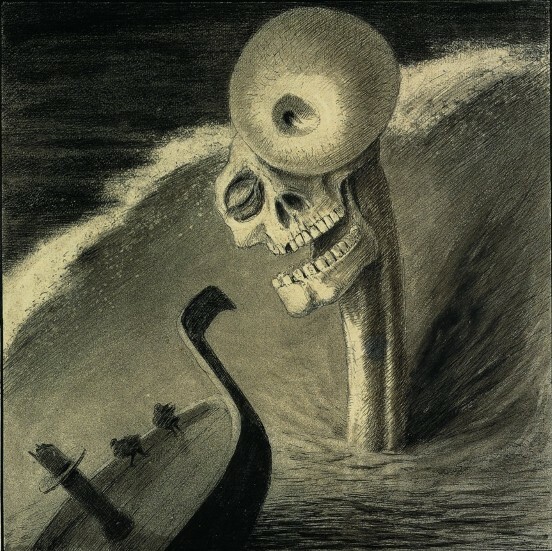 I think I’ll have to invest in the other one, Kubin is one of my favourites. The work featured in Graphic Works is more Symbolist in style than the illustrations in The Other Side, which are stylistically more Expressionist, some of which were initially intended for an unpublished version of Meyrink’s Der Golem. (Interestingly the Hugo Steiner-Prag illustrations for Der Golem are also Expressionist with a distinct nod and wink to the Decadence). 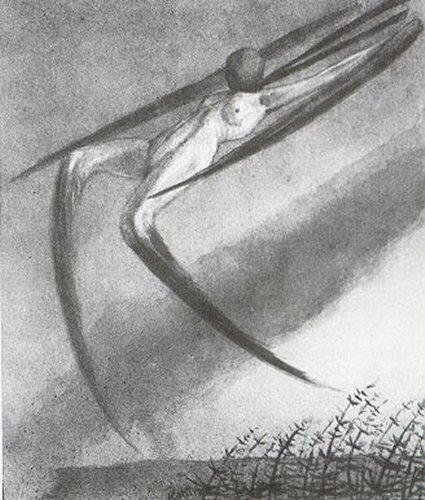 In Graphic Works, Kubin is quoted regarding his inspiration derived from the works of Felicien Rops and particularly Max Klinger. . I can definitely see the influence of Klinger! 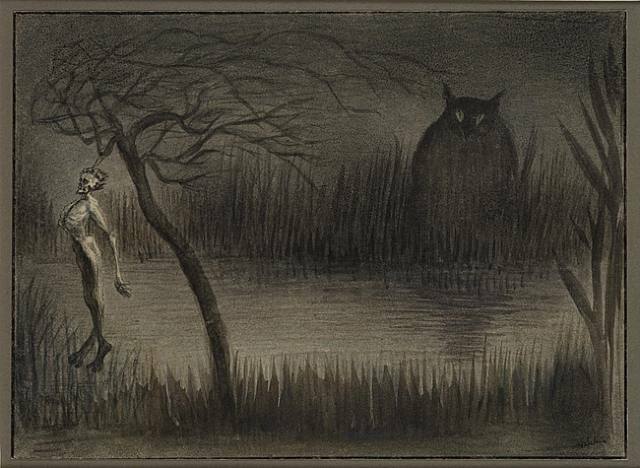 Kubin also reminds me a little of Leon Spilliaert, although I can’t find anything to say that there was any connection between the two. I agree about the Der Golem illustrations. Have you seen the silent film version? It deviates considerably from the book, but it’s full of German Expressionist influences. Though there was a Symbolist manifesto (which perhaps was more pertinent to the literature rather than the visual arts) Symbolism was extremely fluid with great differences in style between associated artists (eg. 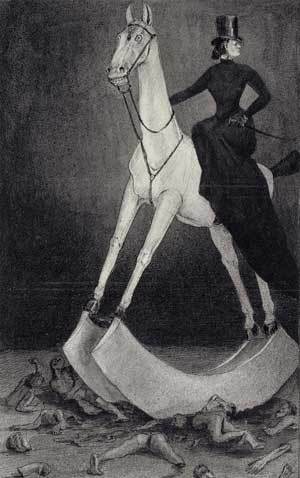 artists such as Puvis de Chavannes sometimes being referred to as White Symbolism and the decadent side such as Rops being referred to as Black Symbolism), Symbolist was a term unused by someof the associated artists to refer to themselves and many did works that would more commonly be associated to other art movements. I personally like that as I am not keen on the idea of art being too strongly defined by rigid rules and manifestos. In a sense I feel Symbolism and some later ‘movements’ are evolution within the greater sphere of Romanticism. I personally feel that the links between Symbolism and Expressionism are possibly stronger than between Symbolism and Surrealism, because of the artists involved and their own progression eg. Munch, Ensor, the Pont Avens school, the Nabi’s, Leon Spilliaert and others. Had they lived longer, I think it would have been more evident still regarding Gustav Klimt and Egon Schiele. Frantisek Kupka’s own individual art progression is interesting, though I much prefer his earlier works. The spirit of Symbolism is I think, distinctive in German Expressionist cinema and Slavic Expressionist illustration. Less so in the more well known Expressionists perhaps, such as Die Brucke group. With Surrealism perhaps it is more due to certain artists looking back to Symbolism for inspiration and continuing the Art of the imagination. Certainly that seems to be the case with Breton and Ernst. Dali was inspired by Nestor de la Torre, but with Dali and some of the others I feel that they were more focussed on technique and mad scenarios that they lost touch with a sincere deeper meaning and as such to me feel more soulless in comparison (whilst the Expressionists were often reflecting reality rather than the Idea in their art, which differs them from Symbolism they retained a more powerful emotive undercurrent). 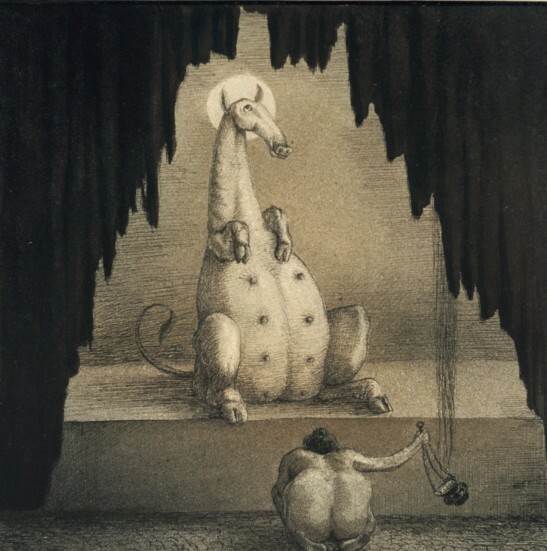 That said Surrealists such as Pavel Tchelitchew, Fantastic-Realists such as Ernst Fuchs and another gloriously had to categorise artist Nicholas Kalmakoff probably retained the spirit better. Love the latest Jan Toorop post. You’re most welcome, I’m doing to learn as much as anything else. And thank you for the suggestions! I love Yamamoto, and Vania Zouravliov is a new discovery of mine. Also, I love your artwork, it’s absolutely beautiful! I also thought I might include Michael Parkes and possibly Kris Kuksi. I agree that it’s clearest when you describe Kubin as a Symbolist. I actually just discovering your site, which I very much enjoy and plan to link to my blog, on which I just posted a section on Kubin and Berber yesterday coincidentally. But I’m glad to find another person whose posting so closely align with my interests. Thank you very much! I’m really no expert in art – my background is in literature – but I’m completely fascinated with the Symbolist artists. Some other present day artists who may be of interest to you perhaps? I am referring you in my paper that I am writing in college about fauvism. And I got to choosed an artist that I like the best. I had chosen you sir. I am asking permission to write a little background information to put inside of my paper. I chose a picture that I had copied and pasted to give an example of your work and how beautiful it is. I hope you dont mind sir. I chose a piece from another web site. The piece is called “The Downfall”(( http://www.artcyclopedia.com/history/fauvism.html). I am so impressed by your work sir with such admiration. I just wanted to ask your permission if it was ok and i hope it is cause my paper is due tomorrow. I apologize if it is not. I mean no harm. Just want to express the talent that you have at hand. I promise that it will go no further. I am working on Kubin a little in a chapter for my thesis. For any who wants to read Die Andere Seite, the English language version is available on the Kindle.